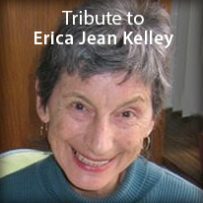 Dana and Eric Brenner-Kelley have let us know that Co-founder Erica Kelley died peacefully surrounded by her family on April 25th, 2018 in Vancouver WA. They wanted the greater Radix Community to be informed of her passing. Erica Jean Kelley (nee Smith), beloved mother, devoted grandmother, and respected community member, passed away at 81 on April 25th, 2018 at The Ray Hickey Hospice House in Vancouver surrounded by loving family members. Born March 6th, 1937 in Oxfordshire, England, she grew up during World War II in Britain with a love of music and became adept at piano from a young age. She immigrated to California in her early twenties. There she met her lifelong partner in love and work Charles Ray Kelley, and together they founded The Radix Institute (an international humanistic, somatically-oriented training organization) in the 1960s. Erica developed, taught, and practiced Radix work around the the world and for many years ran the training institute in Ojai, California. The pair semi-retired to Vancouver in the 1980s. Erica was an active and beloved member of the Unitarian Universalist Church of Vancouver where she volunteered in leadership roles for many years and taught a course on aging with grace. Committed to the arts and social justice, Erica gave generously of her time and resources to many cultural and political organizations, such as Opera Quest Northwest and Planned Parenthood. She maintained her British citizenship and English traditions throughout her life. She was an avid hiker, cultural connoisseur, life-long learner, and dancer; always looking to stay active, try something new, and see the opportunity in each experience. She was often described as a woman of unusual grace. Erica is preceded in death by her parents Margaret and Frederick Smith, sister Patricia Smith, and her husband Charles Ray Kelley. She is remembered with love by son Kevin Kelley; son and daughter-in-law Dana and Eric Brenner-Kelley; stepchildren Kathy Kelley Faegre and Tim Kelley; grandchildren Rhune, Jack, Lily, Rosalee, Raydin, Brendan and Sarah; and great-grandchildren Maisie, Tor, Aron, and Sol. In lieu of flowers, memorial contributions may be made to The Ray Hickey Hospice House, The Unitarian Universalist Church of Vancouver, Opera Quest Northwest, Planned Parenthood or any social justice organization of the donor’s choosing. Family would like to especially thank the staff at Ray Hickey and the members of Erica’s “Dream Group” and “Women’s Group” for their months of love, care, and company. Following cremation, a memorial service and celebration of Erica’s life will be held June 3rd at 2 P.M. at the Unitarian Universalist Church of Vancouver. Erica’s memory and contributions will live on in the many who were influenced and touched by the way she lived her life. A scholarship fund has been set up for Radix trainees. Many things about Erica that I recall. Here are a few that come to mind. How stately and English she felt when I first entered training in 1981 and yet how warm and welcoming she was. In second year of training she had a T Shirt that said ‘I want a lover with a slow hand’. The women in training really appreciated this. Watching her and Dale do the underwater porpoise dance (?) at the Kalani Conference on the Big Island. At the same conference, sitting in the hot tub with her as it poured with rain having a frank and happy discussion about Radix training and Chuck. I fondly recall a genuineness, caring, and interest from Erica that even transcended her role as a teacher. She was most interested in exploration and getting to the truth of things, more so than appearing to have all the answers. I always felt valued and dignified in her presence and enjoyed her directness and her humor. I am bigger for having known her. My first impression of Erica was that she had big teeth. Of course, I was an anxious new trainee and had recently had a session with Renan who, in black, felt like Betty Davis from a scary movie. As time went on I grew to love Erica and over the years spent meaningful time with her. She and Chuck came to Detroit for a wonderful 80th birthday party for him. She was delightful. Later, she and I teamed up to take care of some of the Radix stuff that remained after Chuck’s death. It was great working with her, an organized, articulate, fair-minded, meaningfully engaged person, not a militant, but a gentle advocate. As a wedding gift, she sent me an old silver teapot that she had brought from England. I will always treasure it, as I will the memories of her.